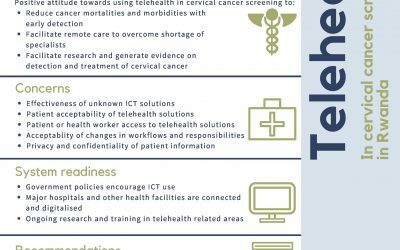 This multi-country project explores the use of telehealth solutions for earlier detection and better treatment options for cervical cancer. The project aim is to align to national health initiatives and specific campaigns. Baseline studies included policy makers, medical doctors, clinicians, patient representatives, insurance companies and other key stakeholders to inform the following stages. 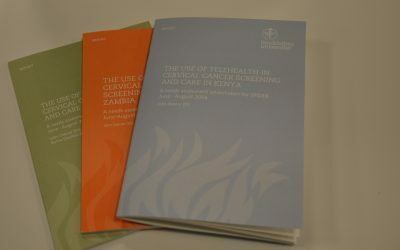 Cervical cancer mortality rates in East and Southern Africa are among the highest in the world. One of the reasons is that the disease is detected late, which means that treatment options are more limited and less effective. Women living with HIV are four times as vulnerable to cervical cancer and resource poor and hard-to-reach communities often lack access to the needed expertise early enough. The project is devided into four stages as shown in the illustration below. Stage 1 was completed in 2016 and stage 2 has commenced in 2017. 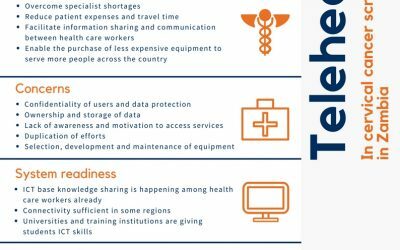 Zambia Health Informatics Association is a not-for-profit organisation focusing on health informatics and advocates for e-health development. Urunana Development Communications is an organisation working with public health through radio shows and community engagement. SEI-Africa has a mission to support close collaboration with African organisations and networks on key environmental and development issues. The Department of Computer and Systems Science at Stockholm university is the oldest and largest ICT department in Sweden. It is also the largest department of Stockholm university.